I think I am going to take the opportunity to explain why I love graphs in this blog post. I’m going to try to explain why looking at problems from the graph point of view opens you up to creative solutions and makes back-end development fun again. The context of our post is flight search, but our true mission is to figure out how to traverse a graph quickly and efficiently so we can apply our knowledge to other problems. There are two things I want you to pay attention to here. One is that we brought back Airports. Two is the destination node has been replaced with a “typed” relationship. 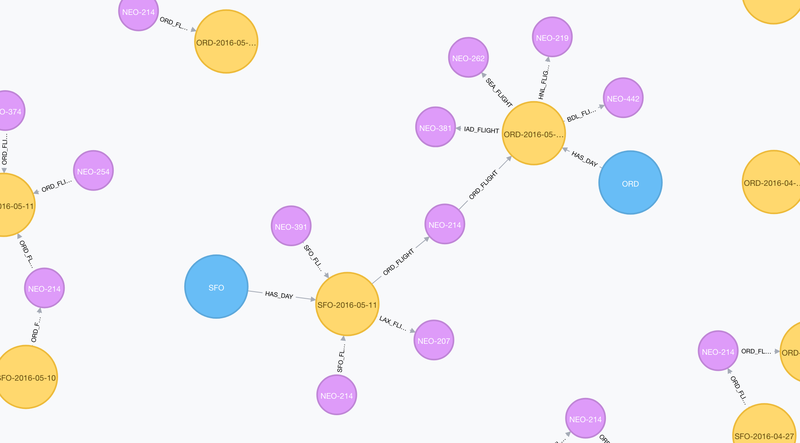 I use “dated” relationship types to make really crazy fast models in Neo4j, but this time the date lives as part of the “AirportDay” node, so we can use the airport code in the relationship type to speed things up. With our model in place, let’s start on the question we want to ask. Given two airports and a day, how do we find routes from one to the other performing the least amount of work possible. 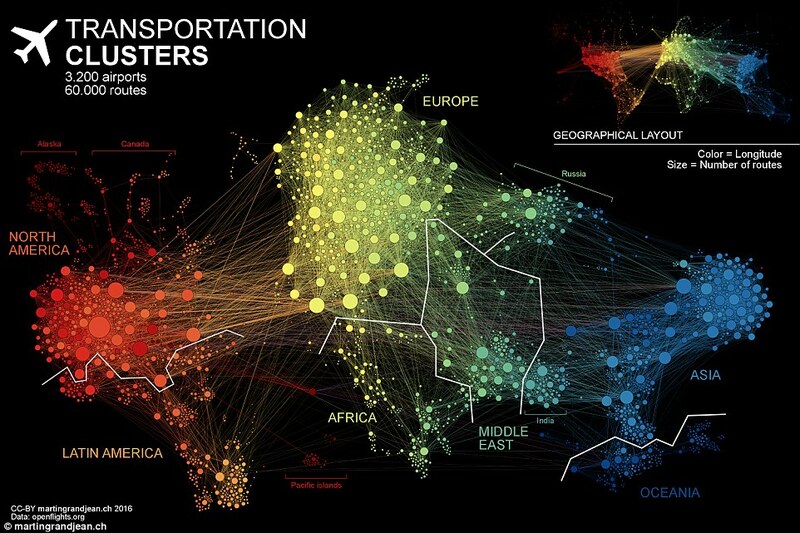 What I came up with is to first traverse just the Airport graph via the FLIES_TO relationships to find the best potential routes between the airports. Then once we have the potential routes, we traverse the lower level of the graph but only by following the routes we found at the higher level. This path restricted traversal at the lower levels will be fast because it won’t waste any time chasing routes that are not optimal. This is where I need you to get to. Dream of your data as a graph and start exploring it one hop at a time. How do I get from here to there? Why would I choose to go one way and not another? How can I limit the amount of the graph I traverse to get to the right answer? Graphs are not just another dumb data store. They are a source of wonder and inspiration and possibility. A new type of freedom to find a better way to solve the problem. All you need to be able to do is embrace it…and well, you have to write the code. But don’t worry, if you can dream it, we can help you turn that dream in to Java code. Ok, that sounded awful, but the point still stands. Let’s see the stored procedure. If you have a wide monitor you may want to open up the source in a separate window and follow along with both side by side. We’ll declare our stored procedure and expect a few inputs. We want a list of potential departure airports, another list with potential arrival airports, a day and two limits. One for the number of flights to return, the second for a hard limit on how long the query is allowed to take. Our maxDistance is just 500 miles plus 2 times the distance between the airports. It is a good heuristic for how much pain our passengers are willing to endure in regards to long connecting flights. Speaking of long flights, we want to avoid them. So we perform our first of two traversals in this flight search query. 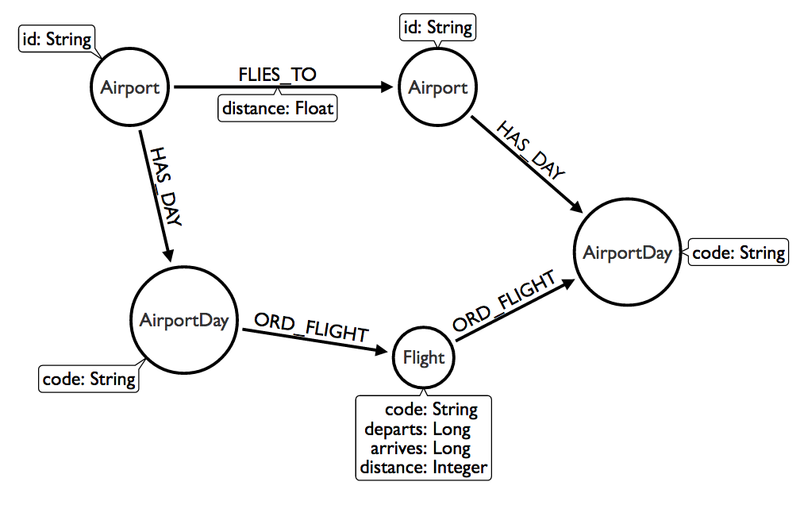 What we want to do in the first traversal is use just the top level Airport to Airport plane of the graph to find potential routes and collect the airport code plus “_FLIGHT” as our allowed relationship types to traverse in the second traversal. This will prevent us from looking at flights from Los Angeles to Chicago that go through Hawaii or European countries. It will keep the traversal on direct and indirect flights that make sense. “allowedCache” is a Caffeine loading cache that figures out the best potential routes between two airports and caches their result. We want to cache the result because you may have thousands of queries for a specific route and since it won’t change very much there is no point in taking the db hit over and over. So what does getValidPaths do? Well, it returns a list of valid relationship types to traverse from each airport at each step in the traversal. The naive approach would have just returned all the relationship types in the potential routes, but that would have let us chase invalid routes as long as they stuck to the allowed airpots. A smarter approach would have returned the relationship types allowed from an airport anywhere along the path, but once again that would have allowed invalid routes since order was not preserved. This version only allows relationship types from an airport at a particular step in the traversal, limiting us to only valid paths and saving us from chasing bad paths. We do this by using a bi-directional traverser since we have both the starting and ending nodes. Now we need to collect those routes, make them quickly accessible and make sure we maintain order as well as potential destinations. Now we can prepare the second traversal. The last thing we have to do is to get the results of the traveral, verify one more time none of the paths found violate our maxDistance number and add their properties to the result. At this point our traversals are done and we just need to order and stream the results. As always the source code is on github… but hey I forgot to mention just how fast this is. Well on a performance test with a years worth of flight data, in the test of two stop queries, my 5 year old laptop was able to do 18 requests per second, with a mean of 72ms and a max of 280ms. Contrast this with the usual 10 second+ wait on most airline websites. im getting this error com.maxdemarzi.import.airports is not available due to having restricted access rights, check configuration. If you are using Neo4j 3.2 you need to add a setting to the configuration file to allow the stored procedure to run. I’ve been reading the whole series of your articles around neo4j and flight data traversal the past couple days, to the point where I think I understand it all reasonably well – thanks very much for such a well done and well documented series of examples! I’ve been playing around with Spring Boot/Data/Neo4j with the @NodeEntity and repository convention – I was wondering if you’ve had a chance to think of how your examples would look like using that style or if your current approach is better? I’m not much of a Spring developer, so I stick with just Neo4j. What is your data source? Is the CSV used still publicly available anywhere?